FAQs & Helpful Links & step-by-step guides.LOOK B4 U POST! Screen 8 (1 of 3) read all three posts. Highlight file> R click> select show file to open window below. B4. Highlight each of the files, clicking on “Rename this file” under “File and Folder Tasks” list on left. -Click yes that you wish to change. Show file will bring up folder containing entire book if you named each file identically. Note location for managing. - Drag and drop all the files to the iTunes Library at top of Source Column of iTunes window. To convert a file to AAC, if not already done so, go to Edit>preferences>Advanced>importing and change "Import As" to AAC. Set kbps to your preference. Set Sample Rate to Automatic. 32kbps stereo is equivalent to audible.com's best quality audio. Recommend between 32 and 40 kbps. Screen shot below: R click file you wish to convert and choose Convert to AAC from dropdown. -- If dropdown shows Convert to mp3, as above, go to Edit>Preferences>Advanced>Importing, and change import as from mp3 to AAC. AAC conversion is slow and consumes significant computer processing capacity. Consider dedicating an unused old computer to this process. Don't forget to reset to 128 stereo for importing/ripping music CDs. AAC is preferred for music import. Do not check Use Error Correction When Reading Audio CD's.. It will slow the process without contributing to quality. Recommend 32/40kbps for audio books and 128kbps for music. Choose Custom and set KBPS, stereo settings. b. Choose Sample Rate: Auto (Will result in 22,020 at 32kbps. Setting at higher rate will limit max length of files which will play OK.) This will permit at least 13.5 hours of play per file. Further testing required. c. Set Channels to Stereo to avoid lock up bug. -Importing window now shows settings kbps and stereo, filter for voice. Before importing music CDs, be sure to reset to 128 kbps for music. Recommend 32/48kbps for audio books and 128kbps for music. Be certain to reset kbps to 128 before importing any music CDs. Sort into ascending order by clicking on Name column until arrow points up. With Library (or iPod) highlighted, type in key words in search "Q" top right of iTunes window just like you would google. Files with key terms will appear in window. To close search and begin a new search, click on X in Q window. Highlight the entire list (Click on top file, hold down shift, click on last entry. Edit>View Options>check or uncheck column heading options. Alternatively and more easily: R click on any column heading, check or uncheck column options and column will disappear or add to right of column cursor was in. Reorder columns by R click column heading, unchecking column to be reordered, and then R click col heading again and check column you wish it to the right of column you are in. Right click on any column heading. Check or uncheck columns you wish to add or delete. To re-order, uncheck a column and then with cursor in column you wish the column to appear to the right of, check the column heading you wish to relocate. 1. With the widows explorer window open to the DVD/CD, highlight all the books/files you wish to place on your computer. Highlight first audio file, then while holding down shirt, highlight last audio file and all the files between will be highlighted. If you wish, hold down control and individually click each file to highlight only those you wish to place on your computer. 2. If necessary, reduce the size of the Windows Explorer Window by clicking the square in upper right of window so that you can see the iTunes and Windows Explorer windows simultaneously. Left click and hold on any one of the highlighted files and drag and drop all the files to the Library entry at the top the source column (far left). The files will begin transferring into the iTunes Library and your iTunes Music folder. For use by anyone who wishes to utilize in their posts, links to the above screen shots. For use in a post, click on Quote this post, copy and paste relevant link to iLounge's stored image into your post. Of each, the numeric image number is image reference number, SS=Screen Shot image only link, FP = link directly to full post with image (erratic, sometimes to top of page). To insert link to one of these images into a post, click on quote of this post and cut and paste appropriate image link into your post. You can also use the image button at top, but that method does not add descriptive information to link -- shows only as a URL. Both will pop up as a new window. Pop up Stopper must be off for iLounge, or must press control when clicking on link. Links pop up without leaving the then current thread. How these screen shots were created: Stensvaag got me going on this with an email he sent with screen shot jpgs and one I sent him back with Tunebite screen settings. 1. Create or open screen wishing to post. a. In Word: Right click on image>/format Picture>Size>Reduce size with height % so that both height and width are <500 max. 6. At attach file in Reply, Browse to an open the file with the HTML save in it and select the jpg file. 8. Duplicates are not allowed, but the image is stored on iLounge at the links above. 9. Only one attachment allowed. Can change in a post with an attachment, but cannot add to a post that did not originally have an attachment. 9. To determine iLounge location of image, right click image in Post, Select Properties, highlight location, copy. 10.To determine the post (only your own), click edit and submit and iLounge will return to post with a post specific url in the windows explorer window. Also a great way to share software option set ups by sending a word document with all the option screens. Saves a lot of typing and eliminates misunderstandings. These links have not yet been checked. This statement will be removed when links have checked out. Post is under reconstruction. Was original lead post and leaving info here until can incorporate into lead or individual posts as answers to FAQ. Audiobook CDs and MP3s can be converted to bookmarking iPod files by following one or more of the guides (stickies at the top of this forum) in the links below. 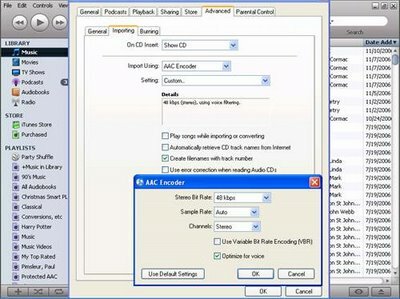 Feed CDs or MP3s into computer and iTunes will read a CD or import an mp3 file (and, if you wish, simultaneously convert to AAC format). These files can be made bookmarking by renaming its extension or by checking remember play back position. Details in the guides, FAQs and Screen Shots. Highly recommend MarkAble - easy and simple shareware to accomplish conversion. Avoid playback probs: convert all homemade files in stereo;limit files to max 5 hours duration. Guide: MarkAble Shareware. EZ merges/converts CD/MP3/WAV to bookmarking files, adds to iTunes, & deletes temp files < using MarkAble $15 PC Shareware> Highly recommended. Q. May I convert audio files, CDs, downloads, etc., into iPod compatible formats? Q. Am I allowed to copy audio files (CDs, Cassettes, electronic downloads, and other audiobooks) into iPod compatible formats? Disclaimer: This discussion is not legal advice. Consult a lawyer for interpretation. You are responsible for your own interpretation and actions. Suggest you read EULAs, google Fair Use, Digital Millennium Copyright Act, DCMA, DRM, and other key terms contained in this post and read applicable law and practice to familiarize yourself with the issues as a basis on which to base your own and independent decision. Converting audio files to compatible files to use on your iPod is legally problematic. Under the court doctrine of “Fair Use” it appears that creating and retaining files made from unprotected (i.e., not DRM) CDs or cassette tapes owned or borrowed is legal as long as the original format is in your possession. That is, you must delete the files from your computer and iPod when you yield possession of the originals. Downloads from iTunes Music Store, audible.com, Net Library, and OverDrive are protected under the DMCA, and are covered by end-user agreements (EULA) which the user electronically accepts when signing up for these services. Free NetLibrary and OverDrive downloads, under the auspices of selected libraries, give users a three-week license, subject to renewal. Although it is relatively easy to do, converting protected files to iPod compatible files is subject to the constraints of DMCA DRM provisions. Fair Use:Courts have held that contemporaneous legitimate possession of an original audio book recording that is not DRM protected entitles "fair use" conversion of these audios for use on your personal iPod. DRM files have very specific legal protection delineated in the Digital Millennium Copyright Act (DMCA). It violates this federal law underlying DRM for anyone to either avoid DRM or even to disseminate how to avoid the protection. NetLibrary and OverDrive specify allowed uses in their user agreements. OverDrive appears to be more lenient. Sale or giving away converted files is clearly prohibited under DMCA. However you interpret DMCA and its provisions relating to DRM and the EULAs of NetLibrary and OverDrive, fair use and reasonable personal ethics dictate your confining use of any conversions to your own personal use, only during the time during which you have originals in your possession, and that you delete conversions from your iTunes library once you do not have the current valid licensed original in your possession. Wikipedia: "Some types of DRMs have been recently declared illegal in France and the European Community is expected to rule on a ban of DRM systems." You may find a google search of “legal conversion of protected files to mp3” and similar terms interesting. Q. What sources are there for audiobooks I can play on my iPod? Where find them? Q. Where can I find audio books that play on my iPod? Are there many audio books available? Are they expensive? What Kinds? Are they all abridged? Where can I find good audiobooks? What kinds of audiobooks will not play on my iPod? audible.com has thousands of abridged and unabridged audiobooks and is the most straightforward source from which to obtain and download audiobooks directly into iTunes. Audible offers a variety of “memberships” that are the least expensive of pay-for-service audiobook providers (book credits as low as $9.56 plus audio subscriptions to WSJ and NYT). Check out audible.com Subscription Plans. You will need to install iTunes and audible.com’s Download Manager, specify your mp3 player, and tell it where your iTunes Music Folder is. When you purchase audible.com audiobooks and download them from your on-line audible library (where they remain available for downloading at any time), the audio books will show up in your iTunes Library with no further action on your part. Audible frequently offers 2 free book credits with a trial subscription or $100 off an iPod with a year's subscription. Audible + iPod User's Guide is an excellent all round explanation of audible.com and iPod. The Complete Guide to iPod Audiobooks (one of iLounge 101 tutorials) by Kirk McElhearn. Complete discussion of audible.com and audio books with screen shots. iTunes Music Store (ITMS)offers easily downloaded audio books. Click on Music Store in iTunes Source column for easiest access. ITMS uses audible.com as its primary source, but some selections, are available only at ITMS. Prices differ, but audible plans are usually less expensive. Audible.com, ITMS, NetLibrary, and OverDrive books are DRM protected and cannot be shared beyond specific registered computers and their iPods. Audible.com purchases are available in your audible library "forever" and may be downloaded as many times as you wish. ITMS purchases may be downloaded only once. Free NetLibrary or OverDrive on-line audiobook protected wma format down loads are offered by some public libraries. Will play only on wma devices or Windows Media Player (standard for windows), but not play in iTunes or on iPod. It is illegal under DMCA to tell anyone how to circumvent protected files. Clever iPodders may be able to combine posts in this forum to convert these files to bookmarking iPod files. Some libraries provide service to out of area property owners as well residents of their state beyond traditional service areas. Some Libraries offer for-fee memberships. Your Public Library probably offers a selection of audio book CDs or cassette tapes. See guides in signature below on how to convert these to bookmarking iPod files. Library audio CDs heavy use frequently results in scuffed CDs which do not play or record well. Using soft cotton or microfiber cloth (Old T shirt, e.g.) wipe from the center of the CD out. Wiping in the direction of the tracks may add scratches. Radio Shack sells a CD cleaning device into which you insert a liquid sprayed CD for a rotating chamois wipe and clean. While you are at it, buy a CD/DVD drive cleaning disc which will clean the CD/DVD lenses and compartment. Each is inexpensive. Helpful links on iPod usage, updates, etc. Links to Official Apple iPod Support includes how-to's and iPod/iTunes updates. iPod 101 Important: Click on Show Me How to view the videos and screen shots. 2. Retry with a different USB port. 4. Reinstall iPod and iTunes software. iLounge Buyer's Guide Download pdf[/b] This guide is already somewhat out of date without nano and describes non-color LCD iPods. I use a Kensington 33185 Digital FM Transmitter/Car Charger any dock connector iPod. Connects to the base of the iPod, thereby using the line out function instead of the 1/8 stereo plug. Powers from cigarette lighter.
. Radio Shack Y connector (about $5) from 1/8 (3.5 mm) stereo plug to dual RCA connectors. Attach to the auxillary input on stereo amplifier. You will be amazed.